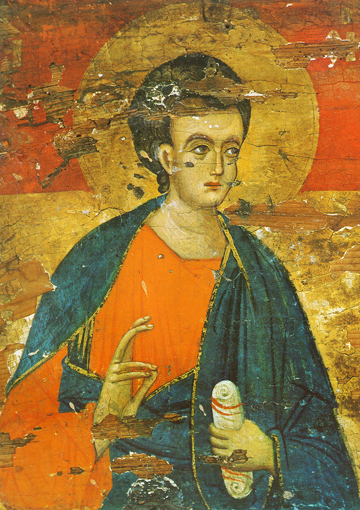 The Holy Apostle Thomas was born in Galilee and was a fisherman. When he heard of Jesus, he left all to follow Him and became one of the Twelve Apostles. He was called the Twin, first because his name in Aramaic is rooted in the word for twin, and also because he had a striking resemblance to Jesus. St. Thomas encouraged his fellow Disciples to die for Christ (John 11:16) and insisted that he, too, see the Lord in His Risen Body before he would believe, as the other Disciples had first disbelieved and then seen. When St. Thomas saw he confessed Christ as Lord and God. After the descent of the Holy Spirit, St. Thomas drew the lot to go to enlighten India and to preach the Gospel. After establishing many churches, converts and clergy, he was miraculously brought back to Jerusalem for the funeral of the Theotokos, but was late. When her tomb was opened at his request, it was found that the Virgin’s body had been taken to Heaven before the general resurrection. St. Thomas also founded churches in Palestine, Mesopo-tamia, Parthia, and Ethiopia. He died after being run through with spears after baptizing the son and wife of a Mylapore Indian prince.